Are there any other categories of mobile learning activities that you feel need to be included in a book on mobile learning? If so, would you please add a comment to this blog that includes that particular mobile learning category with a phrase of definition or explanation of the term. Thank you very much. With your help, this book will better help modern language teachers as they begin mobile learning to improve their students modern language communication skills. Please forward to any other modern language teacher who uses mobile learning for his/her reaction. My Spanish spontaneous speaking activities (24+) includes Structured Speaking (Students substitute in or select words to communicate in pairs), Speaking Mats ( Student can talk using a wide variety of nouns, verbs and adjectives to express their ideas in pairs or small group), Modified Speed Dating (Students ask their partners one question from a card-whole class), Role Playing (Students talk as people in pictures or drawings from 2-4 people), Spontaneous Speaking (based on visuals or topics in pairs), and Grammar speaking games (pairs or small group). Available for a nominal fee at Teacherspayteachers: http://bit.ly/tpthtuttle. At the same site, I have a series of modern language visual stories with no words (the beach, the city, school, etc.) for two students to role play; the restaurant role play involves four students. These can be used in any language since there are just visuals, no words. 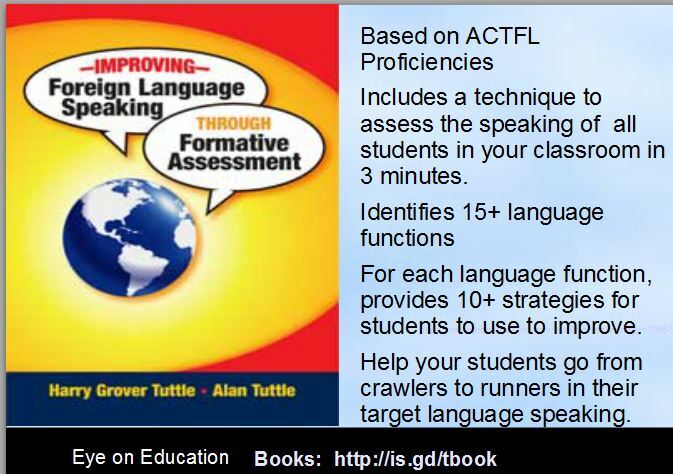 With the new teacher observation system, modern language teachers have to be able to show student gain from a pre-test to a post-test (student learning outcomes or SLOs) Although many teachers have opted to use a grammar point such as the future tense as their performance measure, I would suggest that having a speaking goal is much more impressive. For example, a teacher could state that as a result of studying the vocabulary and grammar of the school unit, students will be able to say ten sentences about school. For a pre-test students talk to their partner who records the number of sentences said about school at the beginning of the unit. Most students will say no sentences or they may be able to make up one or two. The teacher collects these partner sheets and transfers them to her official sheet or puts them directly into a spreadsheet. After studying the unit, the students can easily say ten random sentences to explain what they do in the class such as “I study. I do my homework. I work alot. I write. I have three pens. I work with a classmate. I talk in Spanish. I look at pictures. My Spanish book is big. My teacher teaches.” Again, they can tell these sentences to their partner who counts the sentences and records the number. The teacher collects these partner sheets and records them on her official sheet to show the dramatic increase in sentences said. She puts the numbers in a spreadsheet to get both individual and class achievement. She produces a chart that shows the very low scores in the beginning speaking and the very high speaking scores at the end. Administrators who see the results will be doubly satisfied. Not only has the teacher shown improvement in his/ her students’ academic growth but he/she has had them speak which is what many administrators see as the main goal of modern language study. They see this as a worthwhile performance goal. How will you show student growth in your modern language class? My Spanish spontaneous speaking activities (29+) includes Structured Speaking (Students substitute in or select words to communicate in pairs), Speaking Mats ( Student can talk using a wide variety of nouns, verbs and adjectives to express their ideas in pairs or small group), Modified Speed Dating (Students ask their partners one question from a card-whole class), Role Playing (Students talk as people in pictures or drawings from 2-4 people), Spontaneous Speaking (based on visuals or topics in pairs), and Grammar speaking games (pairs or small group). Available for a nominal fee at Teacherspayteachers: http://bit.ly/tpthtuttle. A modern language learning mat or speaking mat allows students to quickly find words that they want to use to talk about the topic. These mats derive from the learning mats used for very young children who see an alphabet mat, a numbers mat, an animal mat or for older children such as a states mat. Foreign language mats usually follow one of two formats: critical words and expressions for several important topics or critical words and expressions for a specific topic. Speaking mats differ from the usual foreign language textbook listing of vocabulary such as classroom words listing. Most textbooks supply just a list of common nouns such as “chair”, “teacher”, and “book”. However, that list probably does not teach the students how to say “The chair is uncomfortable”, ” The teacher praises me”, or “The teacher always corrects me” which are expressions the students would want to say. Most modern language speaking mats organize the topic by categories. For example, a clothing speaking mat may include a category of the actual clothing, a category of describing clothing, a category of where clothing can be worn, and a category of asking questions about clothing. The category of the actual clothing is the smallest category in the speaking mat, on the other hand, the description of clothing category, usually adjectives, is the biggest category since these are the words that students most often want to use in talking about clothing. The modern language students use the speaking mat as a quick reference; if they do not know word, they look it up on the speaking mat that has both the foreign language word and the English word. The speaking mat has all the critical words in one location as opposed to a student having to look up each word in a dictionary or to constantly ask the teacher. These foreign language students use the mat to orally express their feelings about clothing and to describe clothing. Extend Speaking How many consecutive sentences do they say? Use dice.